T.S. Intrepid – Cheshunt SCC win the 12th Indefatigable Trophy. Indefatigable Old Boys, are invited to attend the following event and ceremony. T.S. 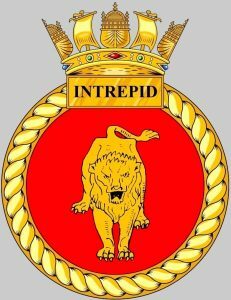 INTREPID – CHESHUNT SCC SEA CADET CORPS – Win the 12th Indefatigable Trophy. It gives us the greatest pleasure to congratulate ‘T.S. 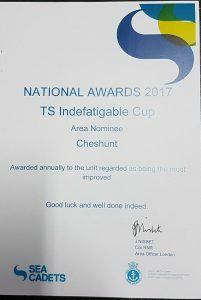 Intrepid – Cheshunt SCC’ on being awarded the Indefatigable Cup for 2017 (awarded 2018). For SCC Unit HEAD-COUNT: Please indicate to me (Steve Humphries) if you wish to attend this event <steve_c_humphries@btinternet.com>. Date: Confirmed Friday 1st June 2018. Time: Arrive at 18:30 – In time to carry out formal parade and Inspection for 19:15. till approx. 22:00 (times TBC). Dress Code: Mess Uniform / Suit. IOBA Chairman (Andrew Butler 77/78) will be traveling to the Unit to make this very special presentation on behalf of you, to A/PO (SCC) Matthew Tregoning Commanding Officer of ‘T.S. 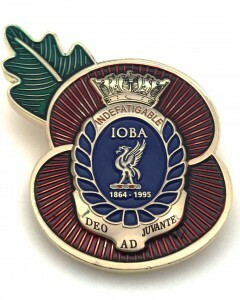 INTREPID the ‘Indefatigable Cup’, known once as the ‘Merseyside Navy League – Swimming Gala Trophy’, and a monetary award on behalf of the IOBA. The Unit made sustained progress throughout last year 2017, with an effective training programme and the taking part of District and Area events. This has required huge effort and commitment and they thoroughly deserve the award. The Sea Cadet unit was awarded a Burgee by the Captain of the Sea Cadet Corps ‘Captain Phil Russell RN’, the Burgee is the highest award that can be awarded to a Sea Cadet Corps Unit in recognition of the hard work of the Volunteers, Cadets and UMC. Citation: Cheshunt Unit has endured hard times in recent years, losing their unit HQ a few years ago, which resulted in them having to relocate three times to temporary locations before securing their current base. They had moved away from their “home” community, losing not only the HQ they had been in for many years, but also the loss of staff and cadets who all came from the local community. The Commanding Officer at the time worked tirelessly with the UMT to find new premises back within Cheshunt, but with little luck. The endless work and worry resulted in the CO having to step down due to health, with the new CO frequently not able to attend the unit, leaving a young and inexperienced PO to try to run things. 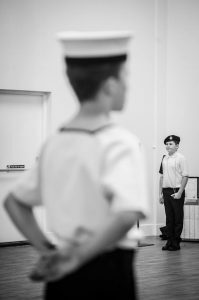 With little adult help, few cadets and just a very small committee, the best they were able to do was keep the two or three cadets reasonably engaged on a parade night. Attendance at anything outside of the unit was nil, and the unit seemed set to close.The CO soon realised that he would be unable to lead them out of their predicament, and handed over to PO Matthew Tregoning a year ago. This young PO stepped up to the challenge and quickly set about rebuilding the unit’s compliment whilst developing his own skills. After approximately two years parading in a delapidated church hall, the unit was notified they would have to relocate again due the redevelopment of the church site. They secured a new HQ in a Scout Hall in Cheshunt which has the benefit of a large playground behind the unit, and cheap, fully fit for purpose premises with some security, allowing this new CO and a previously appointed Unit Chair to begin to rebuild. Cheshunt unit is now back! They are visible at competitions and events and across the community, which is not only pleasing to see but a testament to Matthew and the small team and the work that they have done in rebuilding.Cheshunt’s cadet numbers are now healthy and stable at maximum capacity. 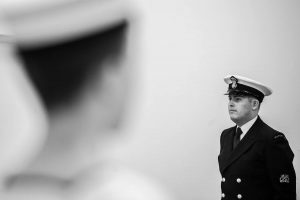 The cadets have an exciting and engaging programme of experiences and they are working on a plan to recruit more adult volunteers to give cadets the best cadet experience possible.In 2016, before Petty Officer Tregoning took command, Cheshunt’s UR score was 46. 2017 saw the RNP score increase to 69, the largest increase in score in the area. The unit was awarded its first pennant for many years, as well as a CSC Commendation – just reward for the dedication and hard work that the staff, committee and cadets have put in over the year to improve TS Intrepid. From near closure to commendation in little over a year – I believe that this is a worthy nomination. Winning this award will give all at Cheshunt Unit the recognition they rightly deserve.